The MixPre-6 features Sound Devices' Kashmir ultra-low noise, discrete, and Class-A microphone preamp. Built with 32-bit A-to-D converters, the MixPre-6 ensures audio recordings surpass those of off-the-shelf, IC-based mic preamps. The unit can function as a USB audio interface and record audio to an SD card while simultaneously streaming multiple channels of audio via USB. Furthermore, the sunlight-readable color LCD of the MixPre-6 provides convenient navigation. It is constructed with a die-cast aluminum chassis, is lightweight, and has a robust build. Plus, it is compact and will fit in your pocket, which is well suited for jobs on the run. Finally, with intuitive operations and advanced mixing capabilities such as ergonomic gain-control knobs, pan and soloing, time-code input jacks, 1/4"-20 mounting capacity, 1/8" headphone monitoring, and the AA battery/Sony L-Mount lithium-ion battery powering options, the MixPre-6 is sure to meet all your audio-application needs. The MixPre-6 bridges the gap between sound engineers, musicians, and YouTubers with user-friendly navigation featuring Basic and Advanced modes. It is designed to allow a user to start recording right out of the box. The MixPre-6's pre-roll feature captures five seconds of audio before the record button is pressed, ensuring the capture of crucial audio even when the operator can't start recording fast enough. Upon installation of the free Ambisonics plug-in (from the Sound Devices Plug-In Store), field recordists, game developers, and VR content creators will appreciate the support for simultaneous multi-format recording (AmbiX, FuMa, LR Stereo, and LR Binaural), real-time binaural/stereo monitoring, and A-Format, B-Format, and A- to B-Format conversion. Sound Devices Wingman, which is a free downloadable app for iOS/Android devices, communicates with your MixPre-6 (running the Musician plug-in) via Bluetooth Smart to give touchscreen access to high-resolution meters, record/stop/play operations, track naming/arming, and more. 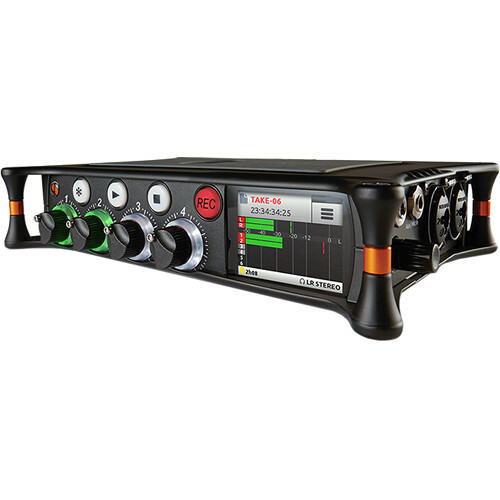 Box Dimensions (LxWxH) 10.5 x 7.4 x 4.2"
MixPre-6 Audio Recorder/Mixer and USB Audio Interface is rated 4.3 out of 5 by 44. Rated 5 out of 5 by Johnny from Great sound mixer Extremely impressed with this, previously I own the Tascam DR-70D, I'm not a sound mixer but a production/filmmaker, so didn't need anything fancy until the Tascam died and decided to get this because of the capability to be able to enter scene/track info the the track so it gets easier to identify and sync during post. I was comparing this with the Zoom F4 and ultimately went with this. The only annoyance is the battery life with the 4 rechargeable batteries last about 2 hours and all the 'additional accessories' cost an arm and leg lol Ultimately, it is definitely a good buy, my colleagues are now thinking of getting a set too. Rated 4 out of 5 by Jim from Excellent Sound Quality. User interface needs work. The thing we love about Sound Devices is the quality of the sound. The preamps are solid. The build quality is ok- not as robust as their earlier products. It's lighter, with rubber & plastic- more to break. Have to remove the battery pack to access the SDHC memory card. NOT a fan of powering the unit off USB C to dual USB A jacks, but at least they provide the cable. Worst is the user interface- the software is NOT plug and play- you really need a manual (from the guys who writes many manuals) because it's just too hard to figure out. Steep learning curve but worth the price for a 3x2 mixer that is compact and sounds great. Rated 4 out of 5 by Richard from MixPre3: Not perfect yet, but still heaven-sent. Mostly high marks. Sound quality, excellent. Light weight, robust. Add my name to following wish list: #1, RECORD button is easy to forget about, what with all the dazzling array of screen colors, light bars, etc. Everything looks so good and is so reassuring, including listening to voice/music thru headphones. Except. Right. I forget to actually depress the RECORD button. Am I the only one whose bus has left without me? Of course, who wouldn't like pro level line/mic outputs, maybe with line/mic switches. That being said, I can hardly wait to purchase next generation MixPre-3. Thanks, guys. Rated 5 out of 5 by Charles from Thoughtfully Engineered and Highly Functional There's a lot to love about this compact recorder. The pre-amps are clean and rich, the controls are easy to use, and it's size is great for working in small spaces. It's clear from the design that a lot of thoughtful engineering went into it- for example, there's a place hidden in the battery compartment for storing a key to engage and tighten the threaded screw which normally hides inside the device. While it does go through batteries pretty quickly if you're using phantom power, the device does alert users when the batteries are running low, saving me from nasty surprises. It's a good choice for beginners who want good sound or seasoned pros who need something a little smaller. Rated 5 out of 5 by Daniel from After a long search for quality sound...I found it Having moved up to an advanced level in videography over the years, it has been especially tough to bring up sound quality to an acceptable level. From camera audio, to the Tascam DR 40 to the Zoom H6...the audio was lacking in depth, S/N ratio and just that "fat" sound I was looking for. The Zoom H6 was good...but the preamps were just too thin and edgy, shrill even. Plugging a good mic into it...it washed out the audio and introduced a lot of noise above level 7.? Then I got the MixPre-3 because of the reviews and the Premix website. Night and day difference. The sound quality on this beast blows away everything I have ever used. When you do a test on this thru a trusted mic...you will feel a smile creeping up on your face. This sounds good, really good. Build quality etc. is high...but the complete silence except of the voice, the "fat" sound, the solid interface...SOLD! Rated 5 out of 5 by Patrick S. from So Much in a Small Package I work as a location sound mixer for low-budget features, shorts and docs. Ten years ago, I purchased a good two-track digital audio recorder for MORE than what the Mixpre-6 costs - and you get so much more bang for your buck. Light, easy to carry (even with the addition of larger battery sleds), responsive, and easy to use with WONDERFUL A/D convertors. The best part, it is easy to configure for incoming timecode and it INSTANTLY locks to my Tentacle Syncs. I'm still testing and becoming familiar with this unit, but I have no qualms at all about this purchase. Rated 5 out of 5 by Anonymous from Superb quality audio at an amazing price point. I have only worked with the Pre for a few days now but I am so happy with my purchase. The build quality is great and the preamps have amazing clarity. One feature I am super impressed with is the analog limiters, they work great. Pros: Great audio, great price, limiters that work, easy to use, small form factor, screen is easy to read and use. Uses the new USB standard. Cons: Need to be able to set gain control to faders. (I'm sure will be adjusted in firmware), AA's burn out fast so you will want a get larger battery pack or a external power pack as I did. (This is not a big deal, its using a lot of power so its understandable AA's drain quickly) Yes there are some things the higher level sound devices have, but at this price point I think they are going to own the market. I expect them to use this as a template for the new 688 type models with a bit more competitive price and I expect those to fly off the shelves too. Rated 5 out of 5 by Steven from Amazing! I do low budget sound. Comedy sketches etc nothing that requires time code or anything crazy. The Mixpre6 is perfect. The sound is crazy good and once you figure out your powering options you're on par with $3000 mixers. No joke. There were some software issues early on but they fixed them right away. Also this company is amazing. They will go way way out of their way to help you. If you don't own one of these you're human. hola, tengo 2 preguntas: la primera, puede el mixpre6 controlar de forma independiente el nivel de cada track en modo ISO recording? la segunda pregunta es cuando habr envo a Chile? El Sound Devices tiene la capacidad de control independientemente el nivel de cada canal en el modo ISO recording . Lamentablemente, debido a restricciones y regulaciones que existen por medio del fabricante, B&amp;H no puede enviar estos productos fuera de los EEUU. How do you get the screw out of the top surface that fits into a DSLR camera? Mine is buried below the surface. Hello, in the back of the MixPre-6 behind the battery caddy you will find an allen key. Please remove it and insert the long part of the key inside the hole (the nut that normally attaches to a tripod) and push up. The 1/4 20 screw is spring loaded and can only be exposed using this method. It contracts and hides inside the hole when it is not needed. Hope this helps. The inputs take XLR and 1/4 I plan to also use this at weddings to patch into DJ system? 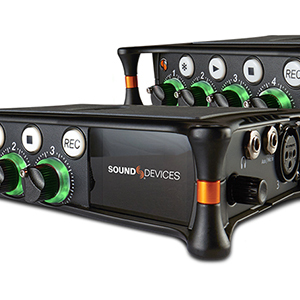 The Sound Devices MixPre-6 Audio Recorder/Mixer is an excellent machine as is everything they build. B&amp;H#SOMIXPRE6 B&amp;H product number. The XLR inputs are the mic inputs and the 1/4 are line in. If you want to patch a feed from the DJ's mixer that will very likely be a 1/4 line out into the 1/4 line input on the Mix Pre. Sound device mixpre 6, For Headphones output, will it be able to power headphones with 600 ohm (impedance) like Beyerdynamic dt 990 ? Will an HDMI splitter cable work to split the timecode signal from my camera to both the MixPre-3 and an external monitor? I am not aware of any HDMI splitters that will perform this task reliably. Why is the Mixpre-3 is limited to 96kHz? Currently, no published information is available as to why the designers of the Mixpre-3 chose to spec the unit to 96 kHz; and not 192 like its bigger brother Mixpre-6. One important detail to know is when either recorder is being used as an audio interface (and not as stand-alone recorders), they are both limited to 96kHz. I connected MixPre-6 to my ProTools but I didn't see the audio signal on the tracks inputs? The recording functionality is dependent on the current operating mode, Basic or Advanced. In Basic mode, the MixPre-6 functions as a two-track 48 kHz recorder. In Advanced Mode, the MixPre-6 is configured as a eight-channel recorder with user-selectable 44.1, 48, 96 and 192 kHz sample rate and 16 and 24bit depth. Check to make sure you are in advanced mode. What would be reasons someone chooses the MixPre 3 or MixPre 6? I am a videographer who currently owns an F4 however the interface is too complicated for me and I hardly ever output to camera. I have a boom and two wireless lavs. Sound Devices did an amazing job bridging the gap between professional and consumer grade equipment. The Mix Pre 3 and 6 are among the latest and greatest lists of products for 2017 featuring solid audio quality, advanced mixing capabilities, but with an intuitive user interface. Both recorders can certainly meet the need for some of the most demanding ENG and EFP applications.